Although this post was informative I am not sure if it’s totally correct. Are you just skimming through the Freshly Pressed line up and making your judgement based solely on the picture next to their name……half the time it’s a cartoon figure, an animal or something related to the blog itself and in some cases the author of the blog doesn’t reveal him/herself, we are left to wonder what he/she looks like. Do you than base your assumption that this faceless author is white just because his or her name? I did a little research of my own …..
My question is….are you just sore because you haven’t been recognized by the Freshly Pressed Crew?? I’m certainly not sore over not being featured on Freshly Pressed. Actually, I was featured on WordPress for the #2 Fastest Growing Blog about 2 or 3 years ago. I’ve thoroughly followed who has been selected for three years, and went to their blogs and discovered that they were not minorities. 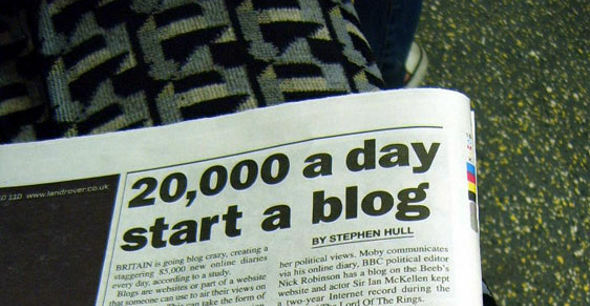 You have selected a hand full of bloggers that have been featured, which is inadequate. For at least three years, the overwhelming majority of the featured bloggers have been White. I have went to the blogs and checked them out for the past 3 years. I haven’t been blinded by the images people put up. Yes, sometimes it’s tough to tell if the blogger is White or Black, but most of the time the bloggers featured clearly present their racial composition. What’s also clear is the lack of serious racial minority inclusion on the WordPress staff. So again, I have been featured on The Fastest Growing Blogs — #2, in fact. I’m pointing out something much more important and greater than me: the importance of racial diversity. Also, what you did is not research. It was a quick and unrepresentative random sampling to justify your point. I have thoroughly investigated this issue over the past three years. 1. They select the best blogs available… diversity be damned, maybe black people need to write better? 2. Blacks are only like 10% of the country, so your wanting more black bloggers to be featured is a bit silly. 3. How do you know that the blogs featured aren’t written by black people? Just because their avatar is white doesn’t mean that’s them. 4. Why must everything be about race! Obama is President get over it. Lol, carry on sir. I hope I covered all of the non-excuses in case anyone was looking to post them. LMBO! Exactly! She is certainly a simple White troll. She was trying to base everything about my piece on me being mad that I’ve never been featured on Freshly Pressed. Little did she know that I was once featured by WordPress on the Fastest Growing Blogs two or three years ago. I made it clear in the piece that it was about other minority bloggers being featured and not me. She simply should have been honest and expressed that she didn’t like me bringing up race in relation to Freshly Pressed. Playing the racist card ey?! Well I’m not sure about that, but I am starting to believe that the people who select the stories for freshly pressed are a bunch of snobbish idiots. While several posts from our blog were sent in, usually there wasn’t even a reply from the moderators. I’m not claiming our posts are better than the selection made, but at least some common decency would be nice right?! Not one time did I mention that they were racist. What I did point out is a lack of racial diversity in the selection of bloggers who are featured on Freshly Pressed. I agree with you that they should have issued a reply to your submitted posts, since that is the courteous thing to do. I do have to question the authenticity of your support for my challenging of WordPress because you suggested that I was playing the racist card, which I did not do. It seems to me that the WordPress staff is not interested in featuring many minority bloggers. This does not mean that they are racist; it just means that they are demonstrating a lack of interest in showcasing bloggers from a wide range of racial and ethnic backgrounds, which is quite unfortunate since there are many excellent minority bloggers using WordPress. I am glad that you will be taking them on in some way this week too. Awesome! I can respect that. I appreciate your support. So I’m a blogger who USED to browse through freshly pressed, and I would have to agree that about 95% of the bloggers featured were white. I think they need to shake things up and add someone people of different color. We have a voice and we need to be heard!!! AMD you should’ve known someone white, would come to the difference of this post. But I’m sure you would’ve …..its something in the water. Simply agree to disagree. Soon as we say something regarding race or discrimination there will be a person not of color to point out, “I Have Black Friends”, “I voted for Obama” etc, and we are supposed to say “oh okay”. Excellent post, well written like always! Thank you very much! Yes, I knew that there would be Whites within the blogosphere and within the WordPress staff who would disagree with my piece simply because they want to deny the lack of racial diversity in the selection of those featured for Freshly Pressed. As I communicated to the two White respondents to this piece, I never called the WordPress staff racist; I simply pointed out the lack of inclusivity in regards to race when they feature bloggers on Freshly Pressed. It is my hope that this piece will lead to greater inclusion of Black bloggers and other minority bloggers on Freshly Pressed — not simply a handful here and there. I am even willing to lend my time for free to WordPress to help curate Freshly Pressed to add greater inclusion of racially diverse bloggers who are featured. I very much appreciate your response to this piece.